Growth of lymphocytes is controlled by cell surface molecules and their ligands including cytokines. To characterize cell surface molecules involved in control of growth of malignant lymphocytes we raised monoclonal antibodies against the human B lymphoblast cell line SKW6.4. One antibody, anti-APO-1, reacted with a 48-kilodalton antigen (APO-1) on a set of activated human lymphocytes, on malignant human lymphocyte lines, and on a fraction of leukemic cells from patients. 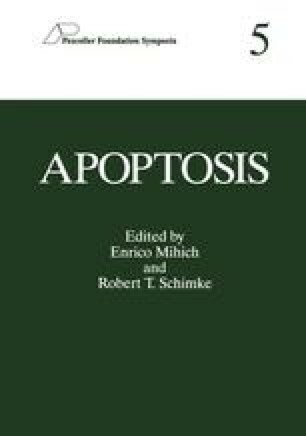 Nanogram quantities of anti-APO-1 completely blocked proliferation of APO-1 positive cells in vitro in a manner characteristic of a process called programmed cell death or apoptosis . Cell death was preceded by changes in cell morphology and fragmentation of DNA. This process was distinct from antibody and complement dependent cell lysis and mediated by the antibody alone1. In the following, results obtained in this experimental system are discussed in more detail.